WEBSTER, N.Y. (CNS) — Christmas Masses in the Diocese of Rochester, N.Y., took on a somber tone as parishioners mourned two volunteer firefighters fatally shot while responding to a fire in a lakeshore community outside of Rochester. Firefighters Michael Chiapperini, 43, and Tomasz Kaczowka, 19, died in a hail of gunfire Dec. 24 after being lured to a blaze that New York State Police said was set by the gunman. Two other firefighters, Joseph Hofstetter and Theodore Scardino, were injured in the ambush and remained hospitalized in satisfactory condition Dec. 27. Police said William Spengler Jr. ambushed first responders before turning a gun on himself. Police are also investigating the remains of another victim found in the charred ruins of the home that Spengler shared with his sister, Cheryl Spengler. 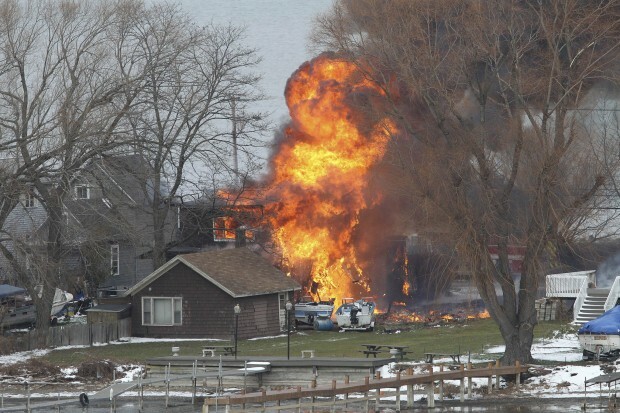 The fire eventually destroyed seven homes as first responders delayed battling the inferno until police secured the neighborhood located on a narrow strip of land along the Lake Ontario shore. Many people at St. Rita Parish in Webster were touched by the tragedy, said Father Lance Gonyo, pastor. Kaczowka occasionally attended Mass at St. Rita when he was unable to make it to his home parish of St. Stanislaus, where he had been active with the Polish community and had been an altar server, staff members of both parishes said. A funeral Mass for Kaczowka was scheduled for Dec. 31 at St. Stanislaus Church. He is survived by his parents and two brothers. Chiapperini, a volunteer firefighter for 25 years, previously served as chief of the West Webster Fire Department. He also was a lieutenant in the Webster Police Department, serving most recently during his 19-year career as public information officer. He was named Firefighter of the Year in mid-December. Chiapperini’s funeral was scheduled for Dec. 30 at Webster Schroeder High School. He is survived by a wife and three children. Father Gonyo told the Catholic Courier, newspaper of the Diocese of Rochester, that Kaczowka was well respected and well liked. Several members of the West Webster Fire Department belong to the St. Rita Parish, and parishioners are praying for them, as well as the two firefighters injured in the attack and the families who lost their homes in the inferno, Father Gonyo said. “It weighs heavily in everybody’s mind,” Father Gonyo said. During Christmas Masses at St. Rita, Father Gonyo read a firefighter’s prayer. He noted that Jesus was born into a time of turmoil and that God is present in the midst of tragedies and troubles. “Incidents like this underscore the great importance of our need for God,” Father Gonyo said. Hofstetter and Scardino released a statement Dec. 26, thanking the community and nation for their support.